Still half way to overcoming in tourism flap from the stigma of having been hit by a calamity, Bohol has been stripped of the slot in the Unesco World Heritage nomination. While new Philippine sites had been eyed for the World Heritage List of the United Nations Educational, Scientific and Cultural Organization (Unesco), at least three items from Bohol have to dropped for hardly “meeting the criteria set by the World Heritage Committee (WHC). Damaged from last year’s earthquake, ancient churches in Loboc and Baclayon have been to be dropped from thelist of heritage structures. UNESCO’s updated list of nominees in the Cultural, Natural, and Mixed Sites categories also excludes Panglao Island, but includes the Chocolate Hills Natural Monument for the Natural category. This came up in a news item published in Monday’s issue of the Philippine Daily Inquirer. Gov. Edgar Chatto said he still has to check the process in arriving at this extent, since what he had read in another broadsheet was about an international publicist that listed eight reasons to visit destinations wherein the Chocolate Hills had been included. Chatto also pointed out that at the Philippine government side, it is the National Historical Institute, the National Museum, and the National Center for Culture and the Arts (NCCA) that are authority in terms of classification of heritage sites. Moreover, representatives of UNESCO had just been here recently and in their discussions, the damaged churches “will remain as areas of interest as far as heritage is concerned with all the effort of reconstruction and rehabilitation”. And the one that will not be rehabilitated, a monument or a marker will be installed to keep it a historical place with its cultural value intact, the governor added. UNESCO is here as an arm of the United Nations and have representatives here, while their base office for Asia is in Thailand. The governor also said that their discussions with UNESCO officials they shared a common stand that these churches, prior to the earthquake, were listed as heritage sites. 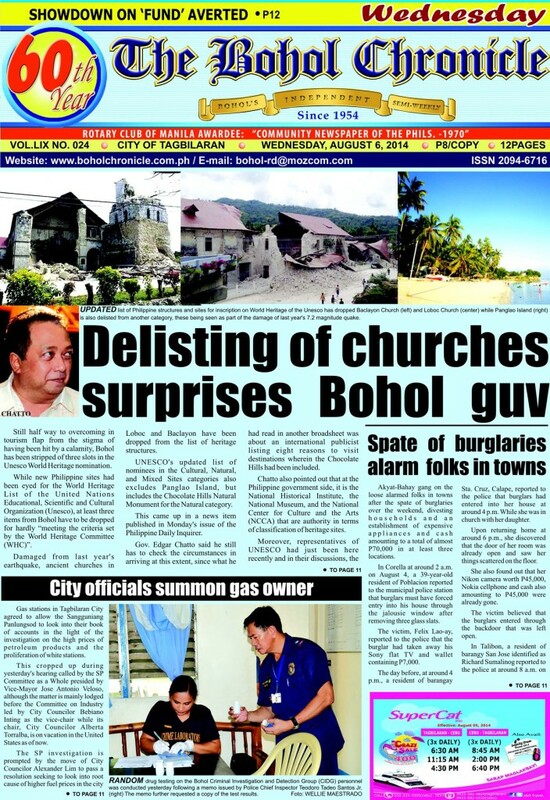 In fact, the church in Panglao had just been installed with a marker and had just been declared a historical site with its tower even declared a treasure, Chatto added. Aside from Loboc and Baclayon churches, Guiuan Church in Eastern Samar had also been dropped having been damaged by Typhoon Yolanda, according to the report.